Springer (London), 298 Pages. ISBN 1-85233-218-2. Order Directly from Springer Machine Vision Algorithms in Java provides a comprehensive introduction to the algorithms and techniques associated with machine vision systems. The Java programming language is also introduced, with particular reference to its imaging capabilities. 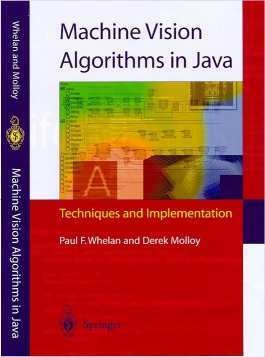 The book contains explanations of key machine vision techniques and algorithms, along with the associated Java source code. A complete self-contained treatment of the topics and techniques essential to the understanding and implementation of machine vision. An introduction to object-oriented programming and to the Java programming language, with particular reference to its imaging capabilities. Java source code for a wide range of practical image processing and analysis functions. Readers will be given the opportunity to download a fully functional Java-based visual programming environment for machine vision, available via the WWW. This contains over 200 image processing, manipulation and analysis functions and will enable users to implement many of the ideas covered in this book. Details relating to the design of a Java-based visual programming environment for machine vision. An introduction to the Java 2D Imaging and Java Advanced Imaging (JAI) API's. A wide range of illustrative examples. Practical treatment of the subject matter. This book is aimed at senior undergraduate and postgraduate students in engineering and computer science as well as practitioners in machine vision who may wish to update or expand their knowledge of the subject. The techniques and algorithms of machine vision are expounded in a way that will be understood not only by specialists, but also by those who are less familiar with the topic. Copyright © 2000. (Paul F. Whelan). All rights reserved.